Now I’m not a designer, but if I was I think I would think this was a very special house! 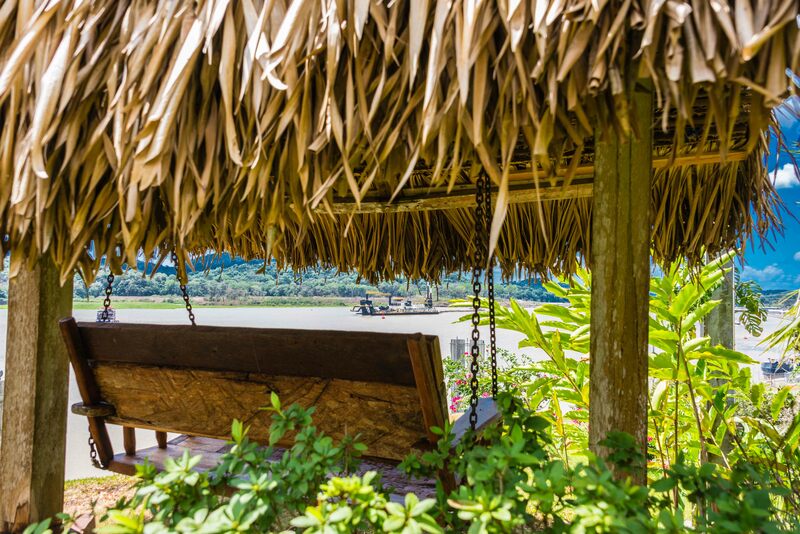 Close your eyes and picture a place on the banks of a narrow part of the Panama Canal. The views from the back yard are completely open to the Canal. 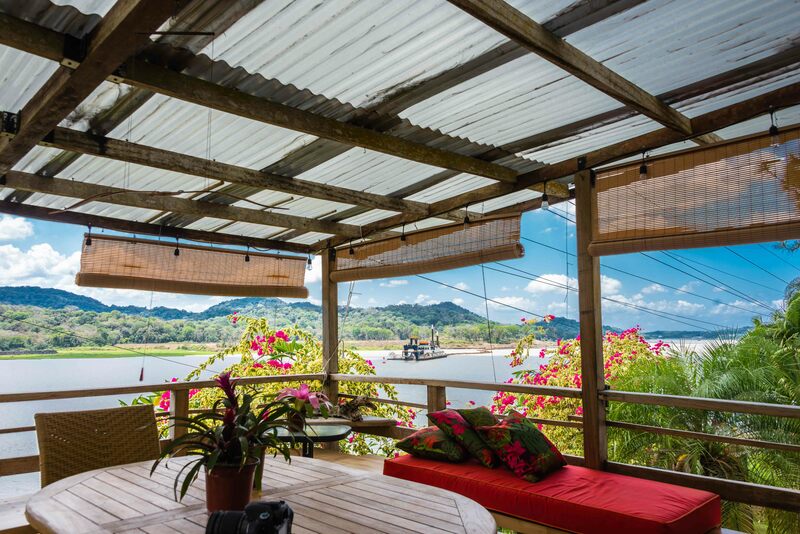 The property is elevated from the Canal by around 30 feet and below, at Canal level, the Panama Canal Railway runs. The ships passing through the Canal are close enough that you can almost reach out and touch them. Binoculars not required! I could sit there, on the shaded swing, for hours watching the comings and goings on the Canal here in this small town called Gamboa. This is roughly half way through the Canal and is the headquarters of the dredging division for the Canal. The spacious back yard is very private. There is a large deck off the rear of the house and a pool for a refreshing dip. Part of the property backs onto the jungle. There is a large outdoor cage containing a very colorful and noisy McCaw. As I walked through the backyard, I met a full size female deer, that didn’t seem to be the least bit bothered by my presence. The people who live there told me that the deer comes to their yard and hangs around while they are home. If they don’t want the deer around, they simply lead it to the gate between their property and the jungle and close it after the deer is out. The deer respects the closed gate and stays out of the yard. Imagine!!! This house is owned by the Canal Company and was corporate housing during the US presence here. The present occupants of this house have been here for many years and over time have acquired many very special pieces of art and furniture from local indigenous artisans and locations where they have travelled. 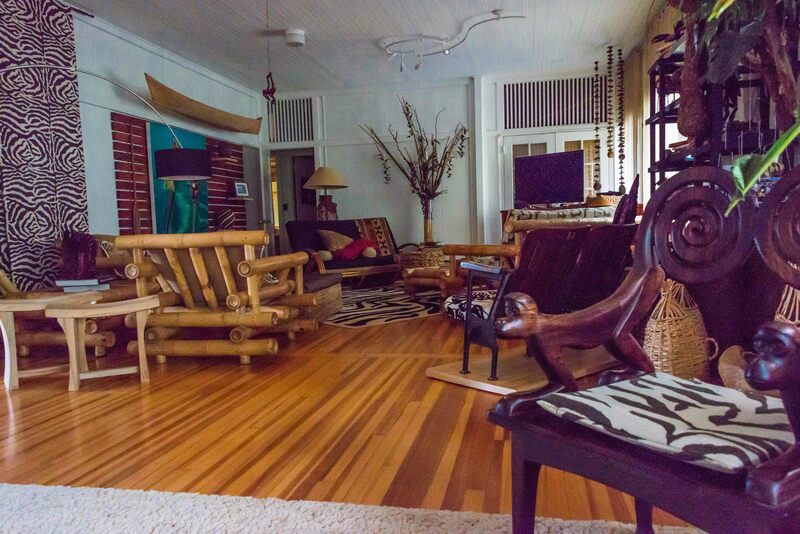 The living room features a couch, chair and table made from large pieces of bamboo. These were brought back from Columbia some time ago. There are two beautiful custom carved wood beds from local woods that were hand carved by local indigenous artists. The detail is amazing. Along with the beds, there is a table with frogs elaborately carved along the front edge of the tabletop. In the living room is another hand carved chair with monkeys carved into the arms. Everything here is eye candy and absolutely unique. What do you think? Wow! We’re you tempted to make an offer on the house?? Would love to but, sadly, the current residents have been trying to buy it from the Canal Company unsuccessfully. Doubt this Gringo would have any better luck.